The first time I tried butternut squash, it was a defrosted puree version from a freezer-burned paper box. Needless to say, I wasn’t blown away by the muted orange mush that came out of it. I knew there had to be more to this popular winter vegetable than its amusing phallic shape. Butternut squash has since become one of my all-time favorites and though it’s definitely at its finest in the fall and winter, its versatility and all-out tastiness makes it a year-round staple for me. Most of the time I serve it with sage or rosemary as a side dish, or swirl it into a creamy risotto. But last night I discovered my favorite use for it–Giada’s recipe for homemade butternut squash ravioli. Oh Giada…why you so good to me? Dice a butternut squash into 1-inch pieces, then coat with olive oil, salt and pepper and herbs. In a skillet, saute shallots and garlic in a little olive oil. Once the squash is roasted (about 30 minutes) toss it in a food processor with 1 cup of ricotta cheese. Don’t hate on my 1962 food processor. Vintage is in. includes cookies. Blend squash, ricotta, and cookies till smooth. packages. The recipe calls for a different shape altogether, but I found that folding them in half and crimping the edges to be easiest. 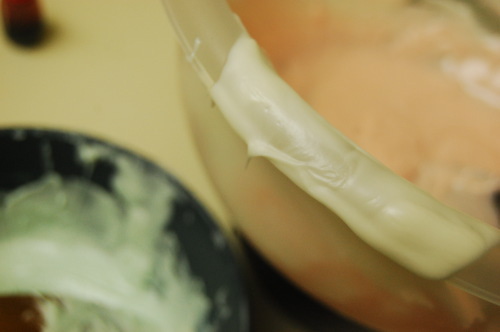 Use a pastry brush dipped in water to seal the edges. Right before boiling the ravioli, whip up a little brown butter sauce. A little nutmeg, a little sage, salt and pepper. To finish, I threw in walnuts for crunch and currants for a touch of sweetness. Boil for 4 minutes. They’re ready when they float to the top. Victory is mine! I was expecting them to burst in the water and send squash flying all over my stockpot. Grate a little parmesan over the top and enjoy!! Have you ever been reading and found yourself thinking, “Good Lord! This book is so good I just…I just wanna EAT IT!” No? Just me? Well, the book I’m currently reading–The Post-Birthday World by Lionel Shriver–has me so completely engaged I just can’t get enough of it. I don’t want to just read this thing; I want to clutch it to my chest and rock it to sleep at night. 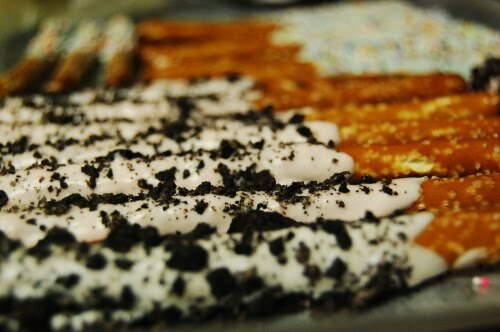 I want to dip it in candy coating and serve it at my next party. I don’t want to reveal much about the content, but the general theme is deciphering the importance of passion versus security in a relationship, laid out in alternate-reality, Sliding Doors fashion. The plot and the pacing are perfect and the writer is so unbelievably talented it makes me want to hog-tie her till she tells me all of her secrets. I’m not finished with it yet (it’s 500 pages, for crying out loud), but I’m savoring the final 150 like they’re the last two bites of chocolate mousse pie. It takes a lot to make me look forward to a 45-minute subway commute, but somehow, thinking about propping this paperback on my knees actually makes me crave my ride to work. Now that’s a good book. 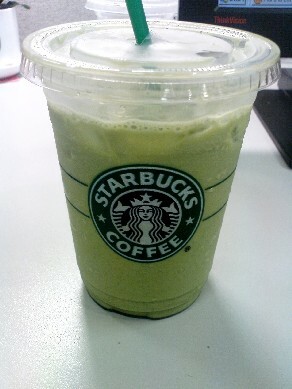 Ever tried the green tea latte from Starbucks? The pukey color had always been a deterrent for me, but I bucked up and gave the iced version the green light last weekend. At first sip, I was struck by a slightly chalky texture, but liked that it was cool and refreshing without giving me the shakes. I read online that Starbucks uses a mix powder that contains honeydew concentrate in it, but I was interested in a simpler green tea flavor, so off I went to the Asian market a few blocks from my apartment. 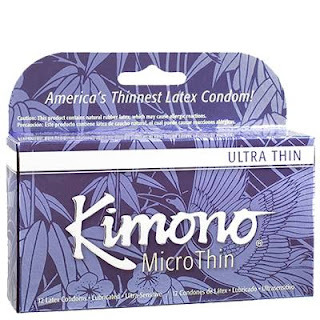 By the way, did you know there’s a brand of condoms called Kimono? I spotted them next to the soba noodles, found them particularly hilarious, mostly because they made me think of the scene from My Big Fat Greek Wedding when Toula’s father tries to find the Greek root for the word kimono. “What does kimono mean? A rrrrrrrobe.” Condom? Robe? Get it? It gave me the gigglies. Anyway, on to aisle two. I came looking for green tea powder, otherwise known as matcha. Or as I like to call it, matcha-matcha-matcha! This little tub cost $10, but should last me quite some time. And considering that any latte at a coffee shop runs around $5, the bottle’s paid for itself in only two uses. This is how I justify purchases. I do it often. The recipe I found uses a pretty basic ingredient list, but I think you could likely adapt to your own tastes since it is quite a lot of sugar for one drink. 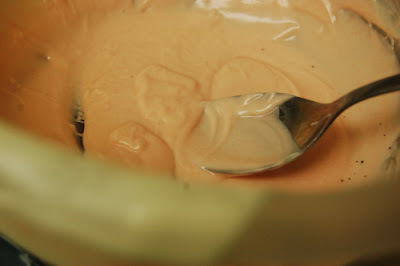 Combine all ingredients in a saucepan over medium heat, whisking until it’s hot and foamy. Next time I make it, I think I’ll add more of the matcha powder, as I was hoping for a stronger green tea flavor and I actually missed the pukey green color. And maybe I’ll use a little less sugar, though I can’t promise anything. Addictions are hard to break. It’s pretty good hot or cold. 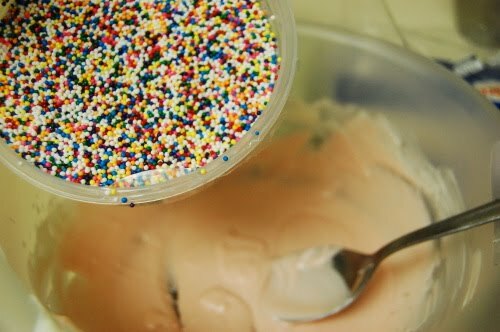 For summertime, I’ll likely make a batch to last two days at night and chill it in a big mason jar in the fridge so it’ll be good to go in the morning. Enough of this sweating-over-my-morning-coffee routine. Has anyone tried using matcha powder? What else do you use it in? 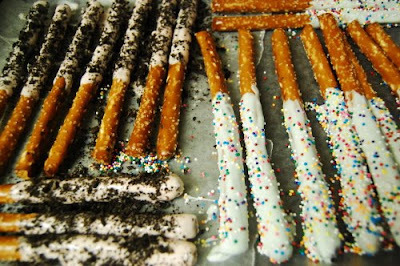 Remember going to birthday parties as a kid and coming home with a treat bag filled with bubbles, trading cards and candy necklaces? Man…those were the days, and sometimes I miss them. Why should kids have all the fun? 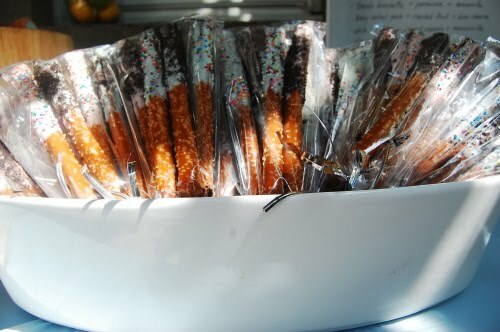 I only had two children at my birthday party, but had sweet party favors at the door for every attendee. Grown-ups work hard all week–we deserve treats too! 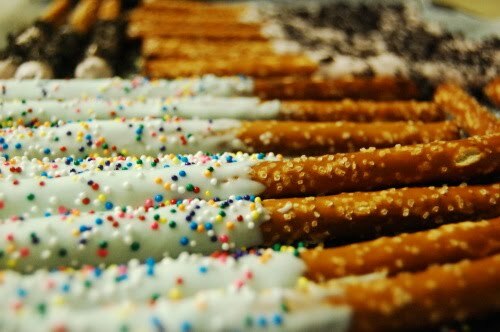 I went with pretzel rods dipped in white chocolate then covered in sprinkles and cookie crumbs. And if I may say so myself, they were deliciously adorable! Melt a bag of white chocolate chips with a teaspoon of shortening in a double boiler over low heat. After melted, I separated the melted chocolate into two bowls, then added a few drops of food coloring to each bowl. After dipping the pretzel rods, scatter sprinkles or cookie crumbs onto the chocolate before it has a chance to cool. Line them up on a cookie sheet covered with wax paper. Make sure to refrigerate the pretzels after coating to ensure they cool and harden properly. What’s the best party favor you’ve ever gotten? Hope all my readers (all four of you) have a delightful weekend! When you move in with your significant other, you have to be prepared for the fact that they do not come alone. They come with their stuff. Stuff that will be jammed in the closet, right next to the dress you’ve tried so hard not to wrinkle. Stuff that clashes so terribly with your own stuff that you find yourself weeping for the way things used to be, when you had full reign over every inanimate object living right beside you. 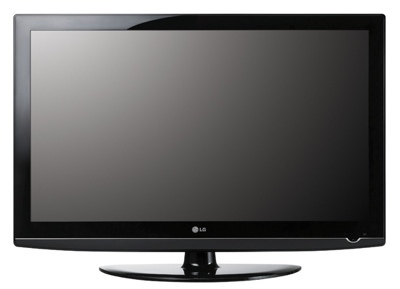 Two years ago, my boyfriend moved an utterly massive flat screen television into my cubicle-like living room, and I felt like Frasier Crane the first time he laid eyes on his father’s ratty barcalounger. He and a friend lugged it in, and it sat heavy and squat on the media cabinet, dwarfing every picture frame and knick-knack in its midst. Then my boyfriend pulled out a foot-long metal elbow and told me he planned to use it to hang this huge technicolor eyesore on the wall. I was at a loss. 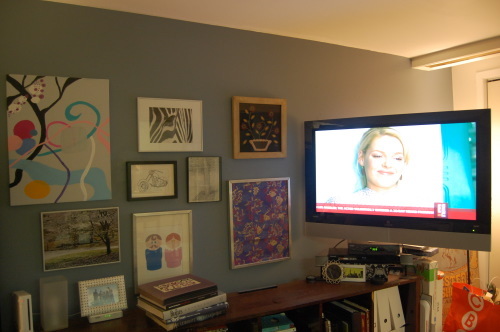 I had lived here for 2 years myself already, and had grown rather attached to the way my moderately sized television, bookshelves and pictures frames had played together. 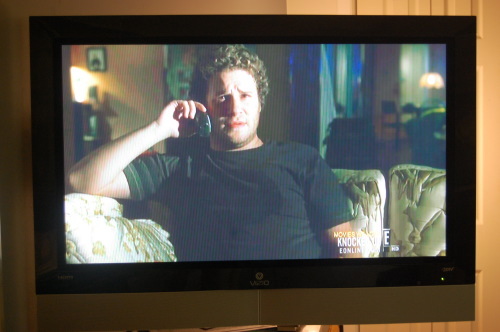 I wasn’t convinced that his TV and my stuff could live happily together. But then he hung it up. It wasn’t that bad. I actually kinda liked it. Maybe a little too much, as the head-shaped dent on my couch can attest. But there still remained the question of what I could hang on the wall beside the TV to create the illusion that we both weren’t obsessed with TV. Cause when you have a tiny wall and a massive television, that’s what people will automatically think. My solution was a gallery wall of variously sized frames to counterbalance the large size of the television. To fill the space, I bought some IKEA frames in various sizes. I ended up framing wrapping paper in two of them to bide my time until I found something I liked better. Yes, they are slightly crooked. Thank you for noticing. A couple weeks ago, I decided to do-away with the old and refresh the art a bit. I arranged the pattern on the floor before committing to spaces on the wall. Not exactly worthy of a spread in House Beautiful, but I think it looks playful, cute and well-balanced. Like 1/3 of all Americans, I beat the heat this past weekend by going to the movies. We saw Inception, and while I found it thrilling and entertaining, it also made me feel like I have the brain span of an avocado. As most people agree, it’s not a day at the movies without popcorn. And I’m not talking about those greasy, unnaturally yellow packing peanuts in a squat $6 tub. I’m also not talking about a microwave popcorn bag that bloats and deflates faster than Janet Jackson between albums. I’m talking about real popcorn, cooked in a pot on the stove with oil, the way that God and Orville Redenbacher rightfully intended. 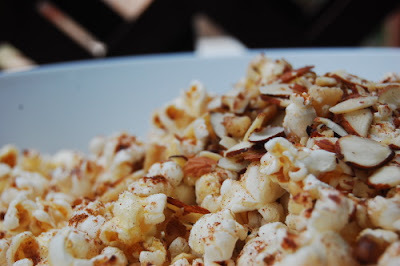 I make it all the time, and am continually surprised that people eat their popcorn any other way since it’s the cheapest, tastiest, and healthiest option besides air-popping. 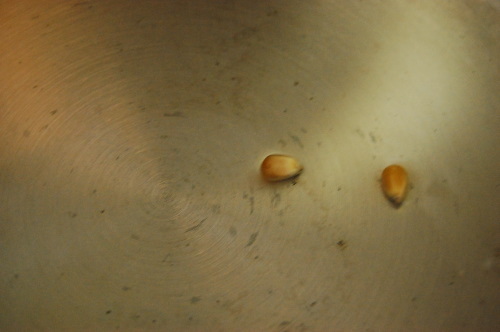 Place two kernels in oil (I find peanut and canola oils work best), and put the lid on the pot. Once those first two pop, that’s the green light to pour in the rest of the kernels. Fill the bottom of the pan with one layer of kernels only. And the type of kernels does matter, in my opinion. It’s tempting to buy the super huge bag for $1.99, but I find that organic popcorn ($5-$6) has a much crisper texture. I’ve had problems using any pot that’s not non-stick. This cheap-o pot from a dollar store actually works best for me, go figure. 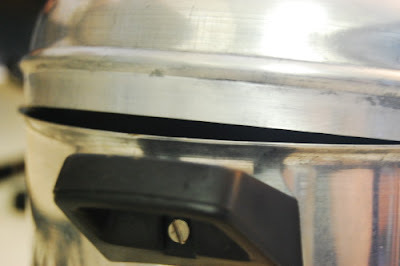 Leave the lid slightly ajar while popping to let some of the steam escape while popping. 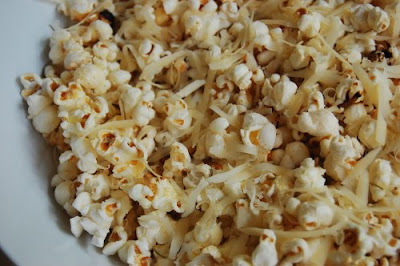 This will keep the popcorn light and crisp. The best thing about making your own popcorn is that you can inject whatever flavor you want to it. I love playing around with new delicious combinations. 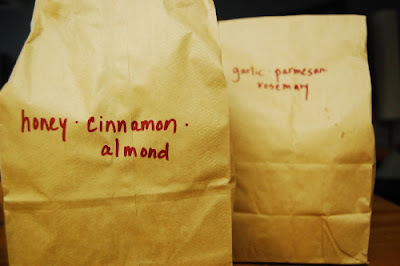 I brought two varieties with us to munch on at the movies this past Saturday. What kinds of goodies do you sneak into the movies? First, a disclaimer about the books I choose to read. Quite often, they’re not what’s topping the current bestseller’s list, but what’s sitting prominently on the shelf at my local Salvation Army. This means I am generally a year behind the times in terms of watercooler talk. Whatever, dude… I’m saving $11 per book. It also means, in the case of Julie & Julia, that I’ve broken the cardinal rule of good little readers everywhere and watched the movie before reading the book. I presume most people know the plot of this book/movie at this point (I am over a year behind the times, after all). A disgruntled secretary starts a blog as she attempts to cook every recipe in Julia Child’s “Mastering the Art of French Cooking”. She consequently gets a book and movie deal, inspiring people to sign up for blogger and wordpress accounts in droves. 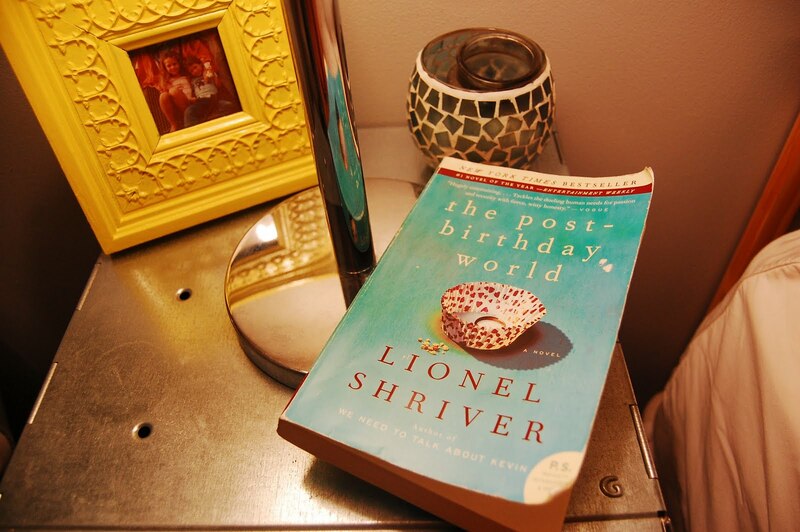 I’ve always liked memoirs, especially when there’s something in there that I can relate to. There were a lot of similarities between the author and myself, which made it really fun to read. She’s a Texan (like me!) who works in Manhattan (me), and lives in Long Island City (you guessed it). I love food, and so I loved reading about her creations in the kitchen and the lengths she took to get the job done. However, and I felt this way during the movie too, I found that I didn’t particularly like the author herself. She’s a bit abrasive and frenetic, and for much of the book it felt like her motive to get media attention outweighed the simple joy of preparing a meal. I found it hard to root for her. Still, I gotta give Julie Powell props; I have no idea how she found the energy or motivation to extract bone marrow and make aspics after a long day at work. Then again, as a new blogger, I can identify with how having even a few people tracking your progress can make every step worthwhile. I mean, look at me. Just yesterday I had a record-breaking six comments on my post. It totally made my day. I am so buoyed, I might even debone a duck when I get off at 5:30 tonight. I also may just order a pizza. Want to know the recipe for the most refreshing summer dessert ever? Combine sugar and water in a saucepan to make a simple syrup, dissolve over low heat, and allow to cool. Working in batches, puree watermelon in blender until smooth. Pour mixture into 13x9x2-inch metal baking pan then mix in the juice of two limes and the simple syrup. Cover with plastic and freeze. Stir the mixture after one hour, then return to the freezer for another hour before stirring again. Allow to freeze for 6 hours or overnight. Scrape and serve.